Brand New Hotel For Exclusive and Intimate Weddings! With its emphasis on togetherness and its dedication to couples’ hopes and expectations the Amavi is likely to top the list of the most desirable for weddings in Cyprus. Opening in February 2019! As the first and only custom-designed couples-only hotel in Cyprus, registered under the Made for Two HotelsTM brand, the Amavi provides the ideal setting for precious moments of togetherness in the sun and overlooking the sea. The name itself is inspired by the Latin quote “Veni, Vidi, Amavi” – meaning “I came, I saw, I loved” – to express a holiday destination where the emphasis is on privacy, tranquility and intimacy à la carte. The hotel’s unique location supports its promise of ‘Holiday perfection for couples’ by providing a sandy beach at its doorstep and enchanting sea views and sunsets from every room. The promenade that leads to the picturesque harbour with the town’s landmark medieval castle is only a short walk away. Whatever the occasion, there’s always the right room or suite at the Amavi. And to help couples relax, recharge and reconnect, leisure facilities include two outdoor pools, a fitness centre with daylight indoor pool, outdoor sports facilities, and a spa offering both individual and side-by-side treatments. Every meal is a treat for two: Amavi’s half-board premium dine-around experience is a culinary tour around four signature restaurants. Dining options range from international buffets in a casual setting, to themed fine-dining à la carte dinners served in a formal and intimate environment, whether indoors, outdoors by the sea, or on the roof garden. Drinks and refreshments are available in the lounge bar, at the pool and swim-up bar, or at the cocktail bar with terrace. The balance of superior gastronomy, spa treatments, leisure facilities and activities stimulates precious moments of togetherness, quality time and shared memories. Important notice: The Amavi works under the couples-only hotel concept with a minimum age of 18 years old for its residents and their wedding guests. The Immenso Celestial Terrace literally elevates your seafront wedding and takes it to a higher level: the terraced rooftop of the couples-only Amavi hotel. To ensure that your intimate ceremony is celebrated in undisrupted privacy, with only the sky above gazing at you, the venue will be reserved exclusively for the wedding party. For couples dreaming of a wedding by the sea, followed by a relaxed cocktail reception in the sun, the Selene Terrace is the venue of choice at the Amavi. With the lounge-style ground floor terrace to themselves, bride and groom can pledge their love in the exclusive company of their wedding guests. After the ceremony, Selene’s open bar will be waiting only a few steps away, ready to serve the chosen menu of drinks and finger food. Depending on the number of guests, the whole area or part of the Selene Bar will be reserved for the wedding party. 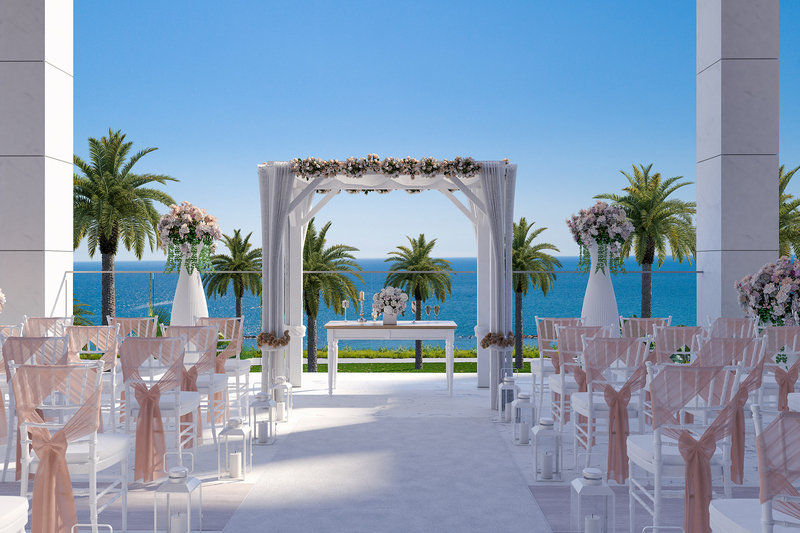 Either way, the romance and happiness of the day will be captured in magical memories, as well as in photos taken against the enchanting backdrop of the Mediterranean Sea. Our Immenso restaurant offers an extraordinary dining experience in a rooftop location, with amazing views from all angles. 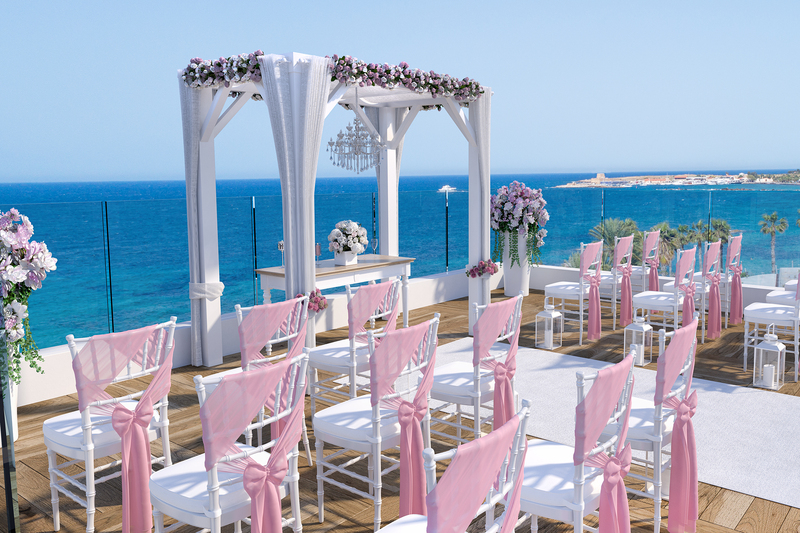 The cascading seating arrangement guarantees magnificent views of the seafront and beach and creates a unique setting in which to admire the surrounding landscape under starry skies, all the way to the Paphos Castle. Immenso is the perfect place for a private, authentic and relaxing meal from the highest point in the area. 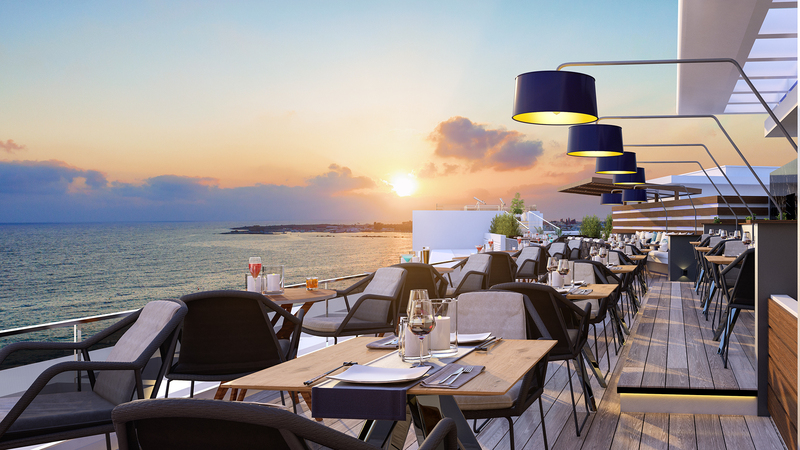 A complete Cyprus summer dining experience only a few steps from the water’s edge. 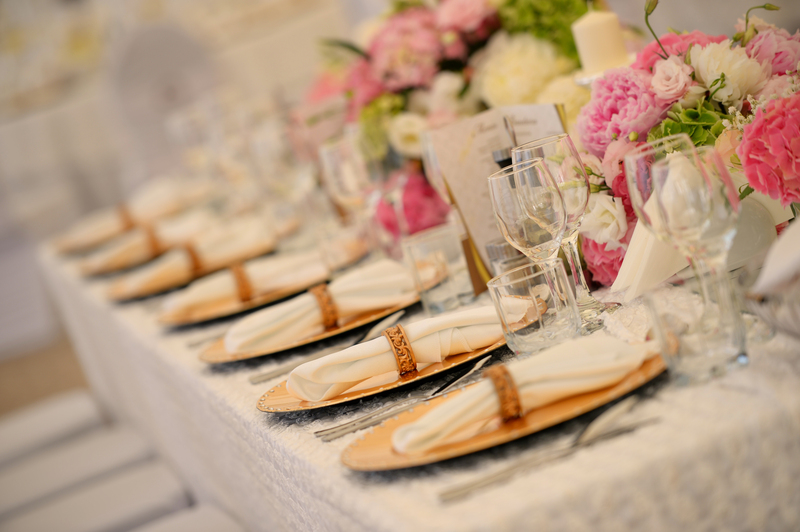 Enjoy your wedding meal while listening to the gentle waves, you’ll love the outdoor terrace, which offers unspoilt views of the Mediterranean Sea.